CLEVELAND – The Cleveland Foundation today announced its November centennial gift to the community – Cleveland Foundation Day of Theater – which will help usher in the holiday season by sharing the gift of some of our community’s theatrical treasures with Northeast Ohio. The gift includes 2,300 free tickets to five separate holiday performances by Cleveland Play House, Cleveland Public Theatre and Great Lakes Theater at PlayhouseSquare on Sunday, Nov. 30. Greater Clevelanders can enter an online ticket lottery system for the chance to be randomly selected to receive up to four tickets to a single performance. The online ticket lottery is now closed. Thank you to everyone who entered. If you entered, you will receive an email letting you know whether or not you have won tickets by 5 p.m. on Friday, Nov. 14. This lottery is not first-come, first-served; residents will be randomly selected to attend the performances. All registered participants will receive email notification by 5 p.m. Friday, Nov. 14, whether or not they have secured tickets. No phone call entries are permitted. People can select only one performance and register once for up to four tickets for a single performance on Nov. 30. One entry per household and email address is permitted. Because this “Day of Theater” is on the busy Sunday following Thanksgiving, the foundation asks all people who enter the lottery to first confirm they will be able to use the tickets if selected. The Cleveland Foundation has played a role in saving or sustaining the three theater organizations that are its gift partners this month, providing a total of $22 million to Cleveland Public Theatre, Cleveland Play House and Great Lakes Theater in the last four decades alone. All three organizations also participated over the past three years in the Cleveland Foundation’s “Engaging the Future” initiative, which focused on helping local arts organizations build their audiences of tomorrow. The Cleveland Foundation’s history of support of Cleveland Play House has included funding for its relocation to the Allen Theatre in PlayhouseSquare. 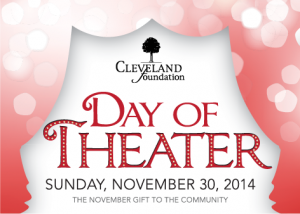 The Cleveland Foundation has been a supporter of Cleveland Public Theatre since shortly after its founding in 1981. The foundation’s support has included funding for various capacity-building and programming efforts. The Cleveland Foundation’s history with Great Lakes Theater has included support for its alliance with PlayhouseSquare and renovation of its current home, the Hanna Theatre. The Cleveland Foundation is inviting all those who are awarded tickets for the performances to bring a non-perishable food donation to be distributed through the Greater Cleveland Food Bank. Special collection bins will be at each theater on Nov. 30. During the foundation’s October centennial gift – Cleveland Foundation Weekend in Lake County – more than 2,500 pounds of food and $300 were collected at The Holden Arboretum and Lake Metroparks Farmpark, which will provide 2,200 meals through United Way Lake County. With today’s November gift announcement, the Cleveland Foundation has partnered with 23 local nonprofit organizations and public agencies for its monthly centennial gifts to the community. More than 130,000 Greater Clevelanders have enjoyed the monthly gifts to date.